Thanks to “Babies” mom Susie Wise, who works at Stanford’s d.school, an incubator for the developing world benefits from the film’s buzz. never make it to the hospital in Kathmandu,” says Wise. 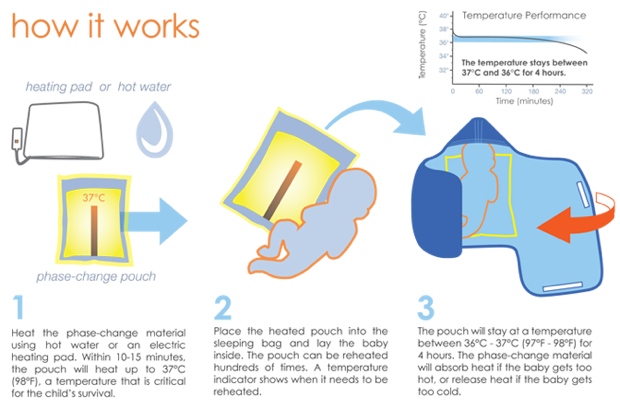 Instead of building a cheaper version of a traditional incubator, they created low-cost infant warmer that looks like a sleeping bag and contains a phase change material that can be made warm with boiling water. 2009, the technology has the potential to help one million babies over the next five years–over 20 million low birth-weight and preemie babies need help worldwide. The first products will be available this year in India, where 40% of the world’s low-birth-weight infants are born. These portable infant warmers made for the developing world cost about $25 instead $20,000 for an incubator.